So as to become a preferential business name, we are thoroughly engrossed in shipping an inclusive collection of Hydraulic Winches. 15 ton Line Pull Hydraulic Winch. 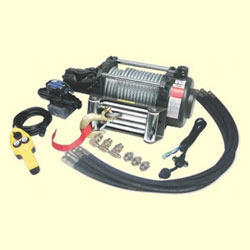 How does a electric winch work? 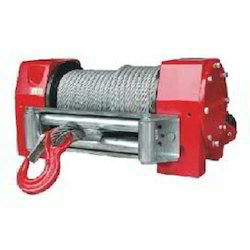 We supply Hydraulic Winches For Hoisting & Luffing & Anchor Winches also. - It is electrically operated Marine Equipment and the pulling capacity of a winch is 1.5 ton. 1. Free spool Clutch – Operated by an easy action lever which disengages the gearbox to allow the wire rope to be pulled out without using winch power. 2. Remote Switch – 12V Cable Operated by Hand held pendant switch assembly with reverse switch and trigger. With the years of experience in this domain, we are capable of providing Hydraulic Winches. These are appreciated for their durability and optimum performance. The superior finish designs of these winches make these require minimum maintenance as well as allow low running costs. Clients can avail our durable and reliable range from us at industry leading prices. We are prominent names in the industry, offering an extensive array of Hydraulic Winch that are functionally advanced and are quality assured. They are strong in nature and are planned as per the client’s preferences. Hydraulic Winch is well-fabricated and comes in varied budgetary limitations.